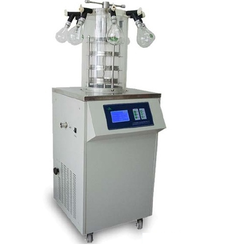 We are Manufacturer, Supplier and Exporter of Laboratory Freeze Dryers India. Our Laboratory Freeze Dryers are specially designed for meeting research and development phase freeze drying requirements in the increasingly demanding R&D centers in industry and academia. 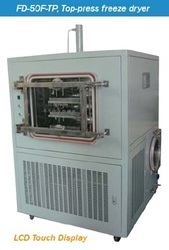 Multi Manifold Top Press Vertical Freeze Dryer is applicable for freeze-drying test of laboratory samples and suitable for small amount of production. FD-18-MTP include the following types: Regular type, Top-press type, multi-manifold Regular type and multi-manifold Top-press type. We are a trustyworthy organization offering a wide a gamut of Laboratory Freeze Dryers. Freeze Dryer is which freeze dried in situ (Patented product). It changes the traditional complicated operation, prevents the pollution of the material realizes the dry sublimation automation. It’s suitable for unit production. 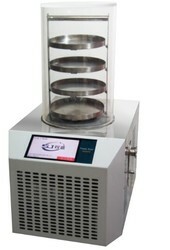 The freeze dryer has heating shelf and programmable function. It may remember freeze drying curve so the users can observe this freeze-drying process of material.